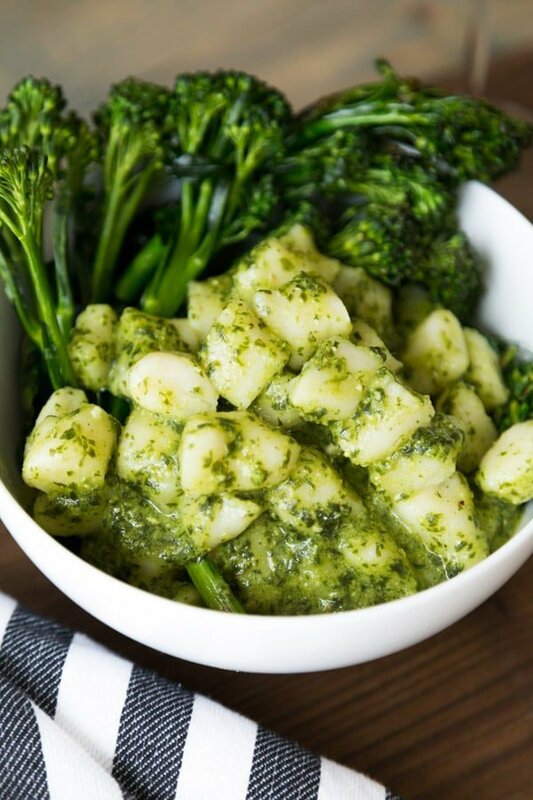 When I think of Italian, I can’t help but think of my two favorite staples: gnocchi and pesto! So why not combine these two to make the perfect dish?! Don’t let homemade gnocchi scare you, it’s easier than you think. And you can’t beat how soft and tender they are when you make gnocchi from scratch. I have to admit, this combo was not my idea, especially adding the rapini. My friends, fiance and I have started having progressive dinners (everyone cooks a different part of a meal and we travel to each other’s apartments for those parts of the meal). 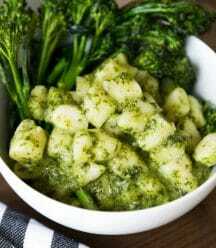 A couple months ago two of our dear friends made the most delicious pesto with vegan gnocchi and seared rapini. It was SO GOOD! Flash-forward a couple months later, I had to have that combo again! So, like any good food blogger, I gathered the ingredients and decided to make it myself. And it turned out so great! 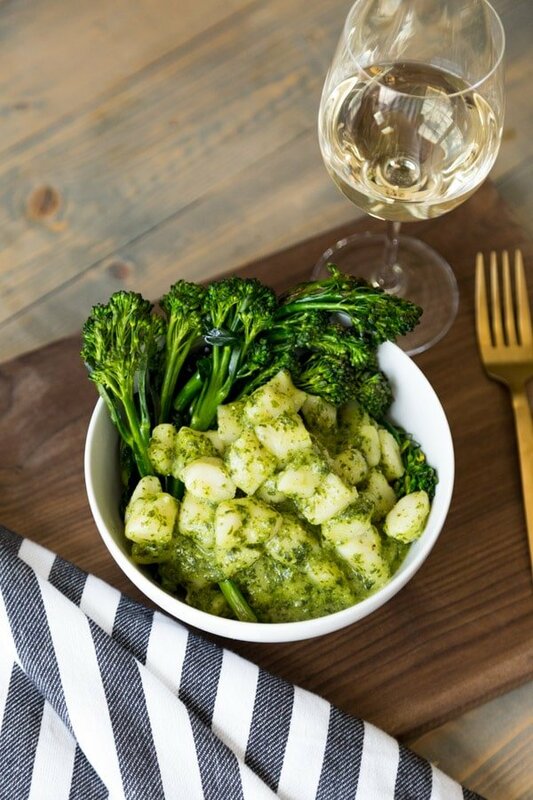 I used our CLASSIC WALNUT PESTO and paired it with this very simple gnocchi recipe. I also seared a bunch of rapini to make a filling and delectable dinner. First- Boil a large pot of water. Second- Peel potatoes and quarter them, then put them in the water and boil for twenty-five minutes or until easily pierced with a fork. Third- Remove the potatoes from water and rice them with a potato ricer. Fourth- Lightly dust a clean counter and place the potatoes on top of it. 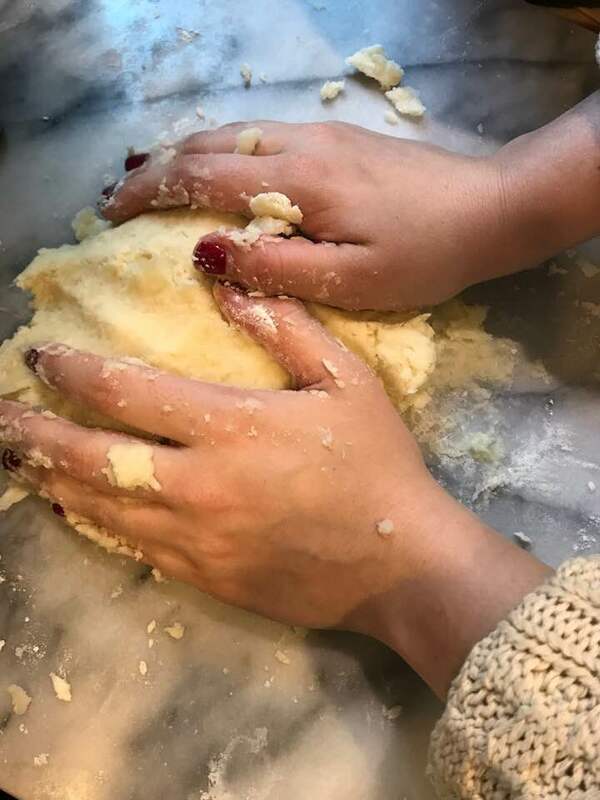 Fifth- Add the egg replacer and half a cup of flour to the potato pile and slowly kneed the potatoes and gradually add more of the flour until the potatoes form a soft dough. 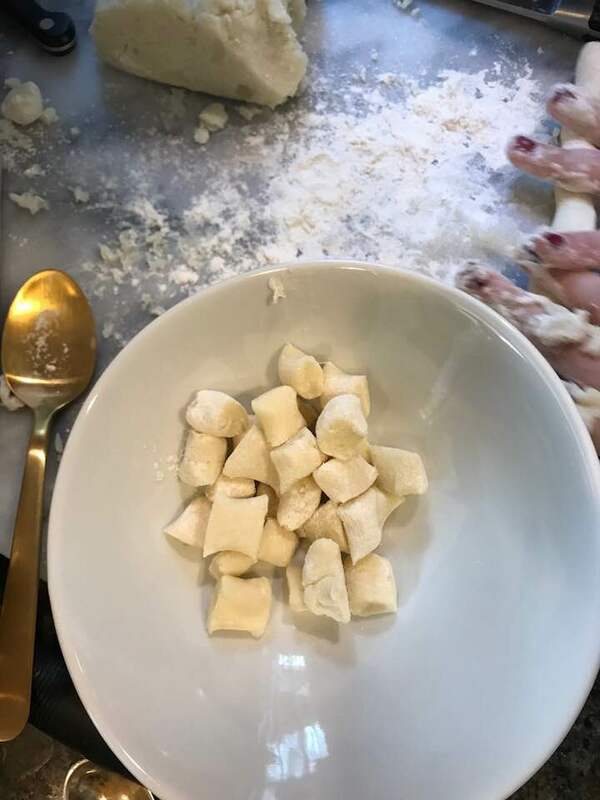 Sixth- Roll out the dough into ½ inch diameter logs then cut into ½ inch pieces of gnocchi. Seventh – Boil another pot of water and salt it, then reduce to a soft boil and add the gnocchi (about 8 at a time to make sure they have enough room in the pot) to the pot and wait till they rise to the top to remove them from the water. Eighth- Set the gnocchi aside and toss with 1 tsp olive oil. Ninth- In a sauté pan, add the oil and heat on medium high heat. Once heated, add the rapini and sauté for approximately six minutes. Tenth- Combine the pesto & gnocchi in a large bowl, then arrange the rapini and pesto in dishes as demonstrated in the photos above. Yes, there are ten steps to make homemade gnocchi, but they’re easy and so worth it. Each and every little pillow of potato dough melts in your mouth, there’s truly nothing to describe the way these feel and taste. And when you add the homemade pesto to the mix, and the crisp and crunchy rapini, you’ll feel as if you’ve been transported to nonna’s kitchen in the Tuscan countryside. Make this dish and come back and let us know what you think. We love hearing from you. And make sure to tag us @veganosity on Instagram so we can see your gorgeous culinary creation. Have you checked out our GREAT VEGAN BBQ WITHOUT A GRILL cookbook yet? BBQ season is upon us, you won’t want to miss out on dazzling your friends with all of our mouthwatering recipes. Click here to read all about it. 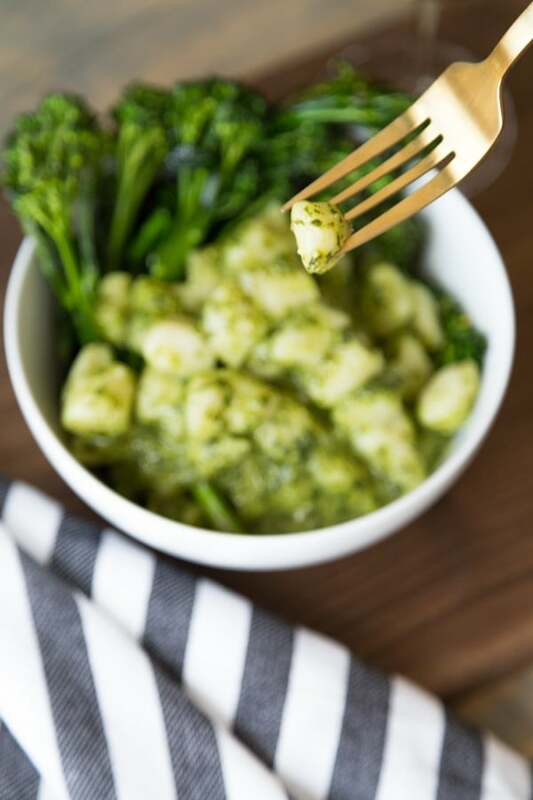 Tender, melt in your mouth, homemade potato gnocchi with pesto and a side of rapini. 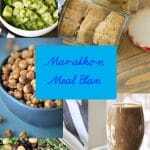 It's easier to make than you think, and so delicious! Peel potatoes and quarter them. Remove the potatoes from water and rice the potatoes with a potato ricer. Add the egg replacer and half a cup of flour to the potato pile. Slowly kneed the potatoes and gradually add more of the flour until the potatoes form a soft dough. Roll out the dough into ½ inch diameter logs then cut into ½ inch pieces of gnocchi. Begin boiling water in a large pot. Add 1 tbsp of salt to the boiling water. Reduce the water to a soft boil. Add the gnocchi (about 8 at a time to make sure they have enough room in the pot) to the pot and wait till they rise to the top to remove them from the water. Set the gnocchi aside and toss with 1 tsp olive oil. In a saute pan, add the oil and heat on medium high heat. Once heated, add the rapini and sauté for approximately six minutes. Add the rest of the salt and pepper to the rapini. Combine the pesto & gnocchi in a large bowl. Arrange the rapini and pesto in dishes as demonstrated in the photos above. I'm a big fan of gnocchi and so it's awesome to have a vegan version so we can make it at home. I love gnocchi in a cream sauce, but your pesto is looking like a necessity! Love it! Cream sauce, red sauce, pesto, it's all good. Thank you Marly! It definitely is! Thank you Holly! 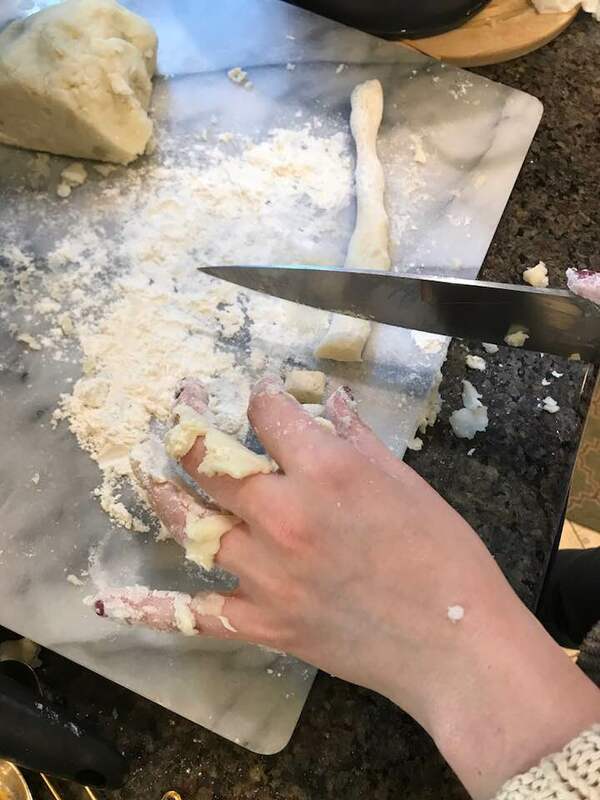 I literally just made gnocchi yesterday. 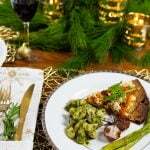 It is so good and really pretty easy. I love the pesto and rapini additions. So green and delicious! Isn't is so easy?! Nothing compares to homemade. Gnocci is one of my favorite things to make from scratch- so easy it's hard to go wrong! I love how you've used the pesto here. Delicious! This looks perfect, we're big fans of trying vegan gnocchi and can't wait on this. Thanks!